Oops, I did it again. My last free Kindle book promo did so well that I’m doing it one more time. 99 Reasons to Hate Cats is free from 9/18 to 10/2. 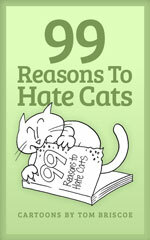 So go get the Kindle edition of 99 Reasons to Hate Cats book for free. If you’d do me the favor of a review on Amazon.com, it would be most appreciated. Also, please spread the word to anyone who would like the book!